An initial run of the slick looking but yet to be rolled out Tesla Model S is already sold out, company founder Elon Musk has said. He added that the initial 6500 pre-ordered all-electric sedans are due to be built next year. The publicly listed Californian electric car maker is likely to be profitable by 2013, Tesla CEO Musk indicated. The company, founded in 2003, is aiming to be the first profitable maker of battery-powered cars. The price tag of a Telsa Model S ranges from US$60,000 to US$80,000, depending on the version. This is actually quite a lot less expensive than Tesla’s current electric Roadster sports car. In addition to the Model S, Tesla is also in partnership with auto giant Toyota to provide EV powertrain parts for the upcoming Toyota RAV4 EV. Tesla has so far received $815 million in funding without yet turning a profit. But hey, it takes a lot of money to start a new car company and compete with the big guys, right? $465 million of that was loaned from the U.S. Department of Energy which, in light of the recent collapse of the government-backed solar panel maker Solyndra, has not gone unnoticed. Tesla is certainly giving performance electric car making a decent go. Founder Elon Musk’s entrepreneurial approach seems to be ‘go big or go home’. He is also a founder and CEO of Space Exploration Technologies, otherwise known as SpaceX, which is attempting to develop reusable spacecraft. Do you think Tesla will survive, thrive, or go under in the years to come? 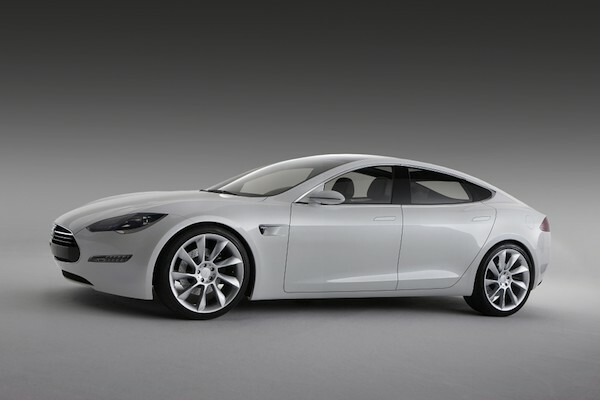 Oh, and how do you like the look of the new Model S?